This is an article that was in the post last week talking about work that they want to do along 4 Mile Run, which divides Arlington and Alexandria to the south. There is a nice bike trail along here that I run and bike on pretty frequently. It would be fabulous if they could clean this area up and turn it into the nice park that it has the potential to become. However projects always come down to money, and the cost for this is VERY high. Not to mention the time frame that they are saying it could be accomplished in, 20 years!!! I have a feeling that I will have moved on from my house along 4 Mile Run by then, so I won't get to enjoy it. Down 4 Mile Run towards National Airport and Rt. 1, there used to be an amusement park. 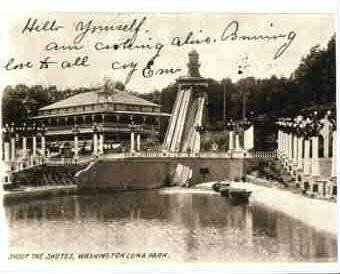 I haven't been able to find out much history on this park, but I did find the picture below on the Arlington Co. website. 80 years later, standing in the place of this neat amusement park is a fabulous water treatment facility! I was even lucky enough to visit that treatment plant when I was in school for one of my Enviromental Engineering classes. Fun Stuff!! 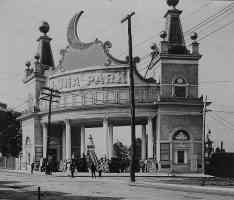 "This amusement park, located in the area where Glebe Road meets Route 1, was built in 1906 for more than $350,000. It claimed facilities for 3,000 picnickers as well as a large ballroom, restaurant and circus arena. Exhibits were housed in large buildings of various styles -- Gothic, Moorish, and Japanese. A "shoot-the-chutes" with a 350-foot incline was a leading attraction. The park was eventually damaged by fire and dismantled in 1915." Hey man, were you able to ride the mtb today? If you did, how was it? The weather was perfect. Damn work. Remember when we went biking down there and there were cop cars and ambulances and then a few seconds later a guy was brought out on a gurney and then moments after that they brought another guy out of the woods handcuffed? It's a pretty awesome park. I think the elephants got loose from Luna Park when it opened and they were running free around Arlington for a while. There was a Luna Park cafe in Arlington (Westover) next to Lost Dog that had a bunch of photos and history on the walls. It's changed ownership/design inside, so I'm not sure what happened to all that info.